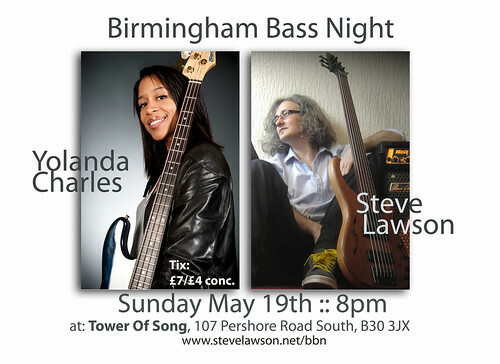 Birmingham Bass Night II – featuring Yolanda Charles! So, we’re back at Tower Of Song, May 19th, 8pm, with a very brilliant headliner… Yolanda Charles. Yolanda has long been one of my favourite bassists, having first heard her play with Urban Species back in the early 90s, then seen her with Carleen Anderson, Paul Weller, Robbie Williams… Her session career is an insane list of massive names – in the studio or live, she’s trusted to do the job and bring something amazing to the gig. Of late, Yo’s been concentrating on her solo project, The Deep M.O. – an absolutely killer funk/soul band that she fronts on bass and voice. She VERY rarely plays completely solo, so we’re in for a really special evening. Notes: The 2nd Birmingham Bass Night is ON! We’re SO SO lucky to have one of the finest bassists in the country to come and headline for us – Yolanda Charles! Yolanda has played with So many massive names – Paul Weller, Robbie Williams, Marcella Detroit, BB King, Eric Clapton, Roger Daltry and Van Morrison, recording bass on a Michael Jackson session with Jermaine Jackson. Also working with Mick Jagger on the Alfie film soundtrack.. just to name a few. Over the last few years she’s been making waves as a bandleader in her own right. Her band the Deep M.O are one of the deepest funk bands ever to come out of the UK. Bottom line is, this is going to be a GREAT night 🙂 Yolanda and Steve will both play solo, and play some things together, unique to Birmingham Bass Night! Allow me to make a suggestion – Lawrence Cottle bringing together the very best of funk and jazz. But whoever the guest is next time, the one thing that we can all be sure of is that it will be a night not to be missed.